Many hormones and neurotransmitters work by binding to receptors on a cell's exterior surface. This activates the receptors causing them to twist, turn, and spark chemical reactions inside cells. NIH scientists used atomic level images to show how the neuropeptide hormone neurotensin might activate its receptors. Their description is the first of its kind for a neuropeptide-binding G protein-coupled receptor (GPCR), a class of receptors involved in a wide range of disorders and the target of many drugs. "G protein-coupled receptors are found throughout the body. Knowing how they work should help scientists devise better treatments," said Reinhard Grisshammer, Ph.D., an investigator at the NIH's National Institute of Neurological Disorders and Stroke (NINDS) and the senior author of the study published online on July 24, 2015 in an open-access article in Nature Communications. The article is titled “Structural Prerequisites for G-Protein Activation by the Neurotensin Receptor.” Neurotensin is believed to be involved in Parkinson's disease, schizophrenia, temperature regulation, pain, and cancer cell growth. Previously, Dr. Grisshammer and his colleagues showed how neurotensin binds to the part of its receptor located on a cell's surface. In the current study, the scientists demonstrated how binding changes the structure of the rest of the receptor, which then passes through a cell's membrane and into its interior. There, neurotensin receptors activate G proteins, a group of molecules inside cells that control a series of chemical chain reactions. For these experiments, scientists shot X-rays at crystallized neurotensin receptor molecules. Making crystals of receptors that activate G proteins is difficult. In most studies, scientists have investigated inactive receptors. "The receptor we crystallized is very close to the active form found in nature," said Dr. Grisshammer. "We may have the first picture of a peptide-binding G-protein-coupled receptor just before it engages with the G protein." To achieve their results, the scientists made multiple genetic modifications to a less active version of the neurotensin receptor they had used before. Experiments performed in test tubes showed that mixing the receptor with neurotensin sparked the G protein reactions the scientists were looking for. When the scientists looked at the structure of the new crystals, they discovered how binding of neurotensin to the receptor caused critical parts of the receptor located below a cell's surface to change shape. In particular, they saw that a region in the middle of the receptor dropped like a draw bridge to link the receptor’s neurotensin binding site to parts of the receptor found inside cells that are important for G protein activation. The scientists concluded that this change may prepare the receptor for activating G proteins. "For years scientists have made educated guesses about how peptide receptors work. Now we may finally know," said Dr. Grisshammer. His lab plans to continue its work in order to fully understand how neurotensin and other G protein-coupled receptors translate messages delivered by neuropeptides into reactions inside cells. 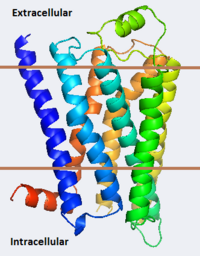 The image illustrates the structure of a GPCR.